Per his military service record (regimental no. 541), William Henry Peppernell was born at Cowra, N.S.W. He gave his age as 28 years and 11 months, his marital status as single, and his occupation as railway ganger. His description on his medical was height 5 feet 7 inches tall, weight 152 lbs., with a ruddy complexion, brown eyes, and black hair. His religious denomination was Roman Catholic. He claimed 12 months previous military experience in the Mullion Creek Rifle Club. ‘W. Peppernal (ganger)’ was named in the Western Age on 3rd November 1915 as one of ‘three young men, railway employees’, that enlisted at the conclusion of a recruitment meeting held in Canbelego [which is near Cobar], at which Private Fern, M.L.A. spoke, that would ‘leave Canbelego by train on Tuesday, and join the Coo-ees beyond Bathurst’. His postal address on his initial Application to enlist in the Australian Imperial Force form dated 30th October 1915 was ‘Canbelego’, and he undertook a Preliminary medical examination at Canbelego on the same date. He was attested by Captain Eade on 7th November 1915 at Lawson (when the Coo-ees were at Lawson), and completed his medical on 13th November at Liverpool. On 19th February 1916 he transferred to B Company in the 36th Battalion, to join his two brothers Frederick and Henry who had enlisted in January 1916. On his embarkation roll his address at time of enrolment was Kerr’s Creek, Orange, N.S.W., and his next of kin is listed as his mother, Mrs Annie Peppernell, at the same address. On 13th May 1916 Private Peppernell (along with his two brothers) departed Sydney on the HMAT Beltana A72, arriving in Devonport, England, on the 9th July 1916. After spending the next four months in England with the 36th Battalion in training, Private Peppernell on 22nd November 1916 departed from Southampton, England, bound for France. Private Peppernell was with the 36th Battalion when it moved into the trenches on the Western Front in early December 1916. His brother Private Frederick Peppernell (regimental no. 535), was with him in the 36th Battalion during the Battle of Messines in Belgium, when his brother was killed in action on 7th June 1917. The Australian Red Cross Society Wounded and Missing Enquiry Bureau Files record Private W.H. Peppernell’s statement made on 6th November 1917: ‘My brother F. Peppernell went out with me in a carrying party for the Messines advance. I saw him last about 30 yards in front of me. The enemy was sniping us and I told him to take cover. He got into a shell hole and I did not see him again. I enquired at the Clearing Station by could hear nothing of him. I have heard since from home in Australia that he has been killed’. On the 12th of October 1917 the 36th Battalion was involved in an unsuccessful attack to capture Passchendaele Ridge near the village of Passchendaele (First Battle for Passchendaele) during the ongoing Third Battle of Ypres in Belgium. During this attack Private Peppernell was wounded in action, receiving a gunshot wound to his right knee, and he was admitted to the 3rd Australian Casualty Clearing Station. He was evacuated to England on Hospital Ship Carisbrooke Castle on 20th October 1917, and was admitted to Voluntary Aid Detachment Hospital Cheltenham Area with a gun shot wound to right thigh slight on 21st October 1917. Private Peppernell was given leave from 21st November 1917 to 5th December 1917, then reported to No. 1 Command Depot. On 3rd January 1918 Private Peppernell departed Southampton to France. On 10th January 1918 he rejoined the 36th Battalion in Belgium. On 12th March 1918 Private Peppernell was promoted to Lance Corporal. William Henry PEPPERNELL. For conspicuous gallantry and devotion to duty. Previous to the launching of a counter-attack by his Battalion on the 4th April 1918, and when the enemy was advancing in force, L/Cpl. PEPPERNELL went forward under heavy fire and located the enemy, affording valuable information to his Company Commander which enabled him to avoid heavy casualties. Decoration recommended MM. The 36th Battalion was disbanded on 30th April 1918 to reinforce other units, and Lance Corporal Peppernell was transferred to the 33rd Battalion in France. On 4th June 1918, Lance Corporal Peppernell was wounded in action for a second time, with a gun shot wound to the left arm, while the 33rd Battalion was in in the vicinity of Villers-Bretonneux in France. He was taken first to the 10th Australian Field Ambulance, then to the 5th Casualty Clearing Station. He was admitted to the 12th General Hospital in Rouen on 8th April 1918. On 10th June 1918 he was evacuated to England. On 11th June 1918 Lance Corporal Peppenell was admitted to Horton County of London War Hospital in England with gun shot to the left arm, severe. On 26th June 1918 he was transferred to the 3rd Auxiliary Hospital in Dartford. On 1st July 1918 he was discharged to No. 3 Command Depot at Hurdcott. On 26th August 1918 Lance Corporal Peppenell was admitted to 1st Australian Dermatological Hospital in Bulford. He was discharged to Convalescent Training Depot, Parkhouse, on 28th August 1918. On 11th October 1918 he was transferred to No. 1 Command Depot at Sutton Veny. Lance Corporal Peppernell commenced his return to Australia on the HMAT Orsova on 8th January 1919. He arrived in Australia on 3rd March 1919. The Leader reported that Lance Corporal Peppernell was welcomed at Kerr’s Creek Railway Station on 10th March 1919 by a large number of residents, and a welcome home function was held that Friday evening, where he was presented with a medal which was inscribed with his name and battalion colours. He was discharged medically unfit on 10th April 1919. Per his military service record (regimental no. 2221), Henry Moss was born at Mossgiel, N.S.W. He gave his age as 24 years, his marital status as single, and his occupation as shearer. His description on his medical was height 5 feet 5 ½ inches tall, weight 152 lbs., with a medium complexion, grey eyes, and dark brown hair. His religious denomination was Church of England. He joined the Coo-ee March at Dubbo. He undertook a preliminary medical at Cobar on 11th October 1915, giving his postal address on this document as “Cobar”. He completed his medical on the 13th October 1915 at Dubbo, and was attested on the 13th October 1915 at Dubbo. He claimed to have no previous military service. After completing the remainder of the march he went to Liverpool Camp. He was appointed as 15th reinforcement for the 1st Light Horse Regiment at Liverpool on 7th February 1916. On his embarkation roll his address at time of enrolment was Bulli, South Coast, N.S.W., and his next of kin is listed as his mother, Mrs. Elizabeth Moss, Bulli, South Coast, N.S.W. 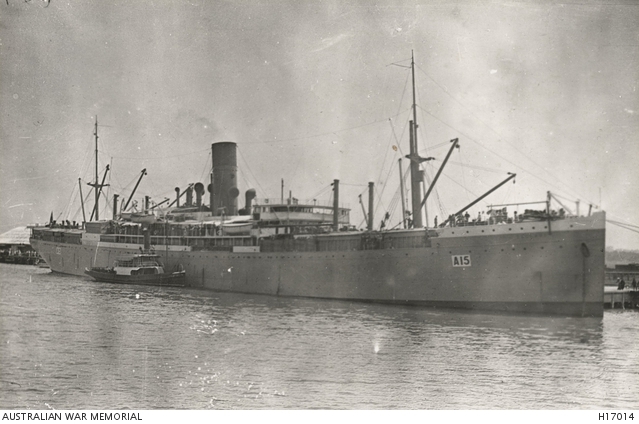 Private Moss departed Sydney on the HMAT A25 Armadale on the 21st March 1916. He arrived in Egypt on the 24th April 1916. On the 18th May 1916 he was transferred to the 4th Pioneer Battalion at Serapeum. Private Moss was appointed Lance Corporal in the field on 17th November 1916. On the 4th June 1916 L/Corporal Moss was transferred to the 45th Battalion. L/Corporal Moss was wounded in action on 7th June 1917, when he received gunshot wounds to his left arm compound fracture to his humerus, and was taken to the 53rd Casualty Clearing Station. On the 8th June he was moved to the 7th General Hospital at St Omer. On the 14th August he was admitted to the 3rd Australian Auxiliary Hospital in Dartmouth in England. On 29th August 1917 L/Corporal Moss was discharged from hospital and sent to No. 2 Command Depot at Weymouth. L/Corporal Moss departed England on 26th September 1917 on the HMAT Borda to return to Australia, and disembarked in Sydney on 25th November 1917. He was discharged medically unfit on 2nd March 1918.